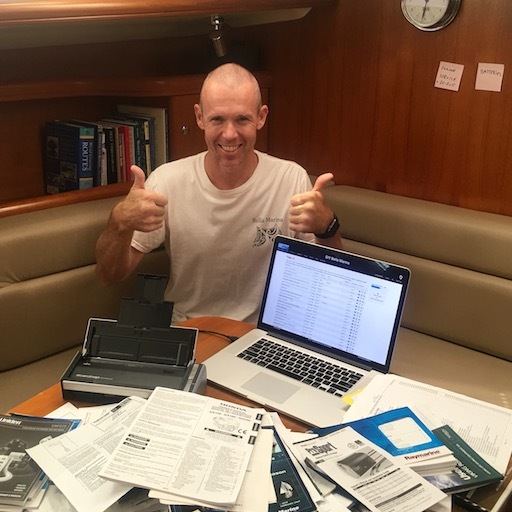 You can use the Quartermaster Log feature to record historical data about your yacht. This can include date of manufacturing, commissioning and purchase of your yacht, registration and insurance information, installation and service information about your yacht's systems, maintenance records from shipyards and marine workers, etc. And last, but not least: pride of ownership. We all strive to be better yachtsmen and captains and a detailed digital log for our yacht is the modern way to achieve it. Systems or Maintenance Logs: For each system, you can use the 'log' menu item under the Actions column to access your logs specific to that system. These are usually called maintenance or services logs. You can use the 'add' button to enter both historical entries about your system, as well as current items. Start with creating a log entry on your system on when it was bought and installed. Then fill in the historical maintenance from your paper records. Include all pertinent information, like parts purchased or receipts for yard service. Ship's or Captain's Logs: Your yacht comes pre-configured with a generic Log accessible from your Dashboard. Use this for yacht specific information, such as purchase and commissioning dates, registration and VIN numbers, Coast Guard inspections, etc. Trip Logs: YYou can create a Trip Log through your Dashboard, similar to the Captain's Log. We are also working on building a more tailored experience for recording your trip information, including more automated ways of recording the trip information. Custom Logs: (You can customize your Logs on your Dashboard to record any other types of information specific to your yacht, like a Fuel Log or a Visitor's Log. As you fill in the historical information in the logs, this is also a great time to scan and digitize any paper records and upload them to the Quartermaster file storage as reference for your systems and logs.